In an imaginary world where people drinks Milk not from cow but from yeast, the fuel filled in cars not pumped from earth’s crust but by renewable microbes and what if bricks of house cured by bacteria rather than heat. Not possible? But researchers are making ways beyond impossible. 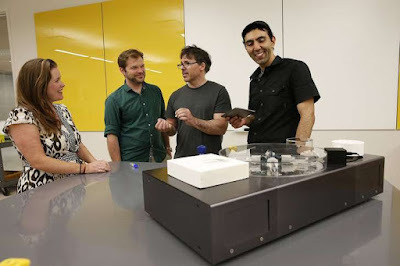 Microbial Design Studio presents a machine fit enough to perch on a table top is the perfect genetic engineering product that can provide things beyond impossible. Orkan Telhan, assistant professor at University of Pennsylvania’s School of Design and his colleagues devised Biorealize that can solve problems using biology. It does not require anyone to have a biology degree or large amounts of money to have this equipment. The equipment needs pre-packaged bacteria to be loaded and DNA on other end, to get the product on outer end. The machine is controlled by software that monitors the process of experiments within. The machine is designed to develop “recipes” that will provide the desired outcome like proteins for medicine, microbes for industrial design, and yeast for food. Telhan claims that it can provide infinite possibilities as the machine develops.